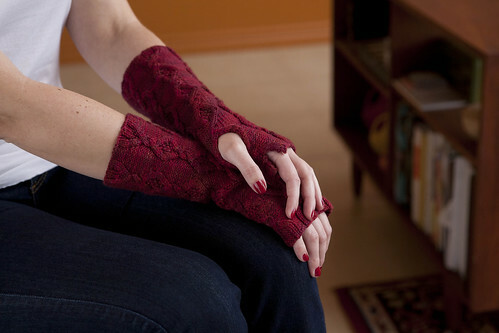 Clark Cable is one of the more advanced patterns in our series, but one of the great things about fingerless mitts is that they make great canvases for practicing new techniques! Cables are often thought of as really advanced, but the truth is that they are surprisingly easy, and they make a great visual impact. We are sure you will have all your friends asking after them when you are done! As always Knitty has a great tutorial with photographs on how to work cable stitches. There is one tiny mistake the original pattern. We did go through and manually correct the patterns that are in the boxes, but we will mention it here again, just incase one was missed, or if you aren’t sure what it means. In round 14 it should read as: P3, k3, turn work so that WS is facing; you will re-work the last 6 sts once more, and all the way round. WS now facing: K1, (p2, k6, p3, k1) four times, p2, k6, p2, k1. Turn. Choosing needles when working in the round on small circumferences can be a bit of a puzzle. In this case Isobel, our test knitter, recommended working with two short circular needles rather than double points as she found the cable needle plus lots of needles a bit of a handful. What are ladders? Well, other than something that you use to reach that last can of chickpeas in the pantry, they are a pesky side effect of knitting in the round. What happens is that there is too much yarn going from one needle to the next and it creates a gap between the stitches that looks like a little ladder. Due to the reverse stockinette background of the pattern it is bound to show up a little bit, but there are a few ways to minimize things. One way is to make sure that the first and last stitches on your needles are pulled snuggly to reduce the amount of extra yarn. Another is to use magic loop or two circs, as this will give you two sets of ladders instead of the three that you would get with dpns. Whatever you decide to do, I am sure that the overall effect of the ladders will lesson once it is blocked. Isobel found that once she had washed them in Soak and eased them into shape, the ladders disappeared all together! It is always a good idea to check your gauge on a pattern, but there is an extra reason to do it on this one. There isn’t a lot of extra yarn, so you are going to want to make sure that your mitten isn’t going to accidentally come out too big as you will then run out of yarn. It is easier to check that your needle size is right and start over than to knit 1.75 mitts and discover that you have run out!